Well, here we are again at the beginning of another beautiful and promising week! I have a full and demanding calendar and a commitment to take care of myself through all of it! Why is this week’s post a “mixed bag”? It’s because, in the spirit of “Mindful Monday’s” I will be sharing three things with you, each having nothing to do with the next but all revolving around health and wellness. Let’s start with some gardening! I am not a gardener and have a notoriously brown thumb. People used to try to equate the fact that I owned flower shops to by ability to grown and keep plant life alive… Not my strong suit. However, I do enjoy creating an environment that makes me feel happy, calm and relaxed. My backyard is getting there but definitely needs some lovin’. My sister-in-law came to visit for a few days and unlike myself, she’s got a thumb that is the loveliest shade of green! Hi Shera! She work in horticulture and was actually visiting SoCal for work. Lucky us! She gave me the inspiration by simply walking over to my flower bed, shovel in hand and removed a crappy bush. 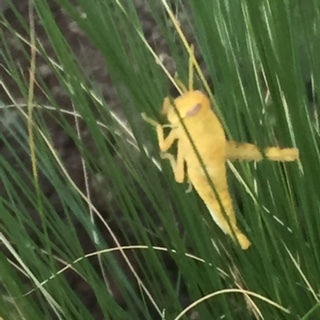 So, I followed suit and removed the bigger, uglier, crappier version that was living right next to it. 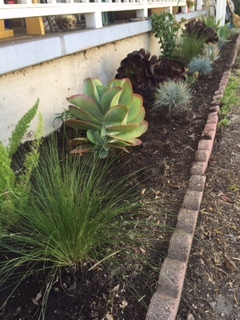 Once we got the stretch of flower bed cleared we talked about what would be right for the spot and settled on drought tolerant succulents. I need something that doesn’t need constant attention and that will do well in our current dry times and beyond. I have zero desire to pour a bunch of water into my yard but would also like it to be a place that I like to go. I turned the soil and amended it with new soil. Once that was complete, set my plants our in the design that felt right to me and began to dig. I was completely done digging by 10:15am. Holes dug and plants in the ground, I retired to the inside of the house and my trusty air conditioner for the balance of the day. 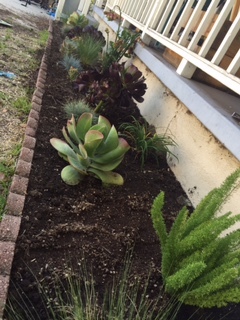 A little dehydrated but feeling proud of my accomplishment and the way it elevated my yard. More to come on this! Next, let’s talk about lube! For your skin, that is! 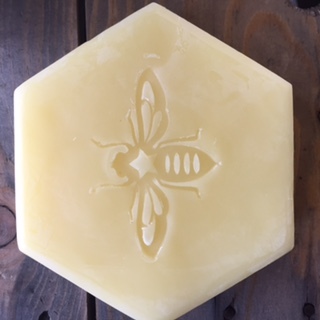 I made some lotion. We’ve known about the harmful chemicals in many of our body products for a long time. We know that the more natural the product, the better it is for us and if it’s store bought, natural often equates pricey. I have been using coconut oil as my primary source of skin moisturizer for sometime now but wanted something that would smell good and feel luxurious… not to mention less greasy. Add all ingredients except essential oils and arrowroot powder to a large mason jar. Fill a large pot with water and place mason jar into the water without a lid. The water level should be about 2/3 up the jar. bring to a gentle boil and allow to simmer until wax is completely melted. 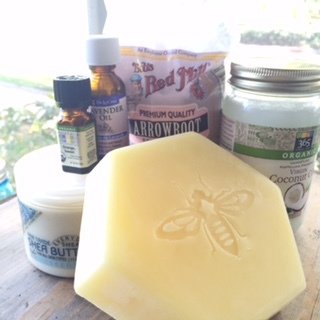 Remove from heat and allow to cool slightly before adding the arrowroot powder and essential oils. Stir occasionally while mixture cools. Once completely cool, it should be creamy and have a bit of a powdery finish. You can store this in an airtight container for 3 months. I doubled the recipe and it worked fine. the yield is about 4 ounces. The next mindful item on my list is lunch! As you may recall, I am challenging myself to lose a few pounds and have been having success by meal planning and exercising. This week, I made my frittaffle again. It’s quickly becoming a staple in my routine. I enjoy switching up the flavors and am seeing a difference in my appetite and energy levels during the first part of my day. For lunch I made a salad that has flavors similar to bruschetta. Tomatoes, arugula, a poached egg, a few slices of crostini and some of the best burrata cheese you have ever tasted. 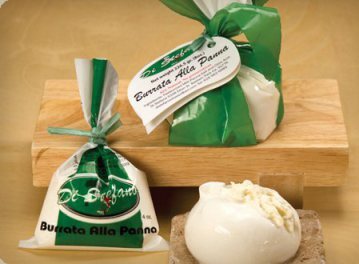 If you’ve never tried burrata cheese, treat yourself STAT! Seriously good stuff here! Sort of like a soft mozzerella on the outside but a bit more wet and creamy on the inside. I halved 5 cups of cherry tomatoes and added 1/4 cup balsamic vinegar, 2 Tbsp. 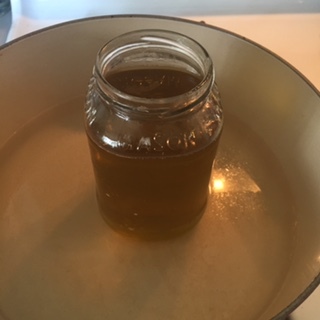 olive oil, 2 Tbsp. honey, 3 cloves finely minced garlic, a handful of fresh basil, chopped and freshly ground black pepper to a bowl and tossed until well dressed. 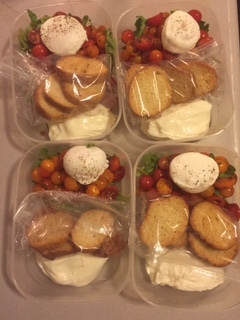 Next, I put a cup of arugula into each of my lunch containers and topped it with the dressed tomatoes. I then added 1/2 cup burrata and a poached egg on top of the salad. Four crispy crostini (about a half cup) placed in a ziploc to maintain crunch and voila! I will enjoy the hell out of this lunch and it’s sure to give me the fuel along with the caloric accountability to keep me on track! If you are a 21 day fixer, you can add one more poached egg and cut the burrata in half. This meal is approximately 392 calories. Enjoy! I’d love to hear any of your meal plan ideas that keep you feeling satisfied all week! Previous Post The Swearing Mom give away!